Tommy Openshaw was the Knights’ starting kicker for 3 straight seasons. In his junior and senior years, he was ranked among the nation’s best kickers by several publications. He had abnormal long range for a high school kicker, regularly connecting on field goals over 50 years including a 56-yarder in a shootout against Episcopal and a 54-yarder to upend undefeated Bishop Kenny in the State Playoffs. 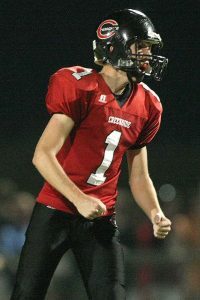 Doubling as the the team’s punter, he averaged 40.8 yards per punt with a long of 68 as a senior. Additionally, Openshaw became school’s first player to earn Associated Press First Team All-State .